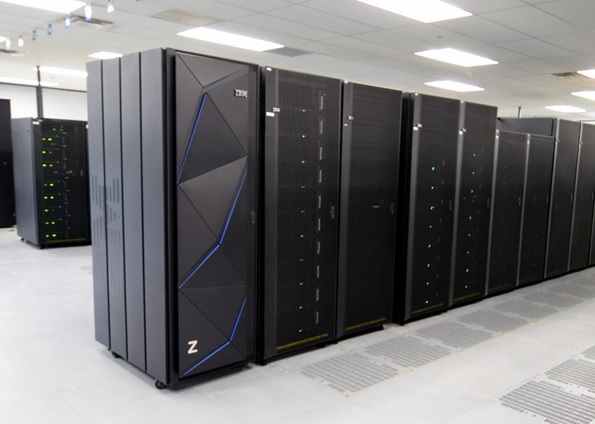 This mainframe blog intends to write on IBM z Systems and high-end and midrange storage associated with it. My intention is to write all kinds of comments, hints and tips and thoughts about news in general, announcements, publications, interesting sites and user groups. Here's an overview of the WDFM (withdrawn from marketing) dates. All details and related feature codes are in the announcement itself. The last dates you can order the withdrawn products are one day before the effective withdrawal dates. No real surprises compared to the previous annoucements. I just notice that OOCoD offerings can be ordered one year longer. This is only the OOCoD offerings, not CBU records. The only thing you can do is order additional tests on your CBU records as long as they last. So you can order a 5-year record in June 2020 and you can add additional tests to that record up to June 2025. I've updated the overview I made the last time. Last week, April 10, 2018, IBM announced the new z14 Model ZR1 (ZG18-0024) and the Linux Rockhopper II (ZG18-0027). Same box, different purpose. I'm mainly going to give you an introduction to the z14 ZR1. By the way, it becomes GA on May 31, 2018. As usual, I'll concentrate on the technical aspects of the announcement rather than focusing on the strategic importance of the platform. Lots of other sources will give you plenty of information about this. Take e.g. a look at this IBM page covering z14 and its relation with Cloud, Security, Analytics and DevOps. I've put the z13s and the z14 ZR1 next to each other here, so that you can immediately see one of the big differences between the two. The z14 ZR1 is now a standard 19'' 42U rack. So it easily complies to the standard datacenter rack requirements. The naming indicates that the z14 ZR1 is just another model of the z14, next to the already known models M01 up to M05. It also has the same driver level as the z14. This means this is already a stable level. But let's get to the content of the announcement. I'll give you the usual survey of the new system starting with some technical specifications and there are also some novelties worth mentioning. Of course the Software Pricing is always an interesting part too. I'll conclude with Physical Planning, Some Caveats, Operating Systems Support and a couple of references to already available documentation. Here's an overview of the z14 ZR1. Also worth mentioning, there's no GA2 announcement for the two-frame z14 that was announced mid July 2017. This seems to be following for both later this year. The z14 ZR1 has machine type 3907. As I already mentioned : quite a different frame than its predecessors. it's air cooled and comes with top exit cabling, bottom exit cabling or even both if you would want that. Cabling means both power and I/O. There is only one model ZR1 as opposed to the two model (N10-N20) setup with the z13s. I propose we immediately take a look under the covers to 'uncover' some significant differences between the z14 ZR1 and recent previous models. You can see that the front view, unlike former models, doesn't really resemble the rear view. That's because we have a different type of I/O drawer, the PCIe+ I/O drawer. Cards can only be inserted at the rear side of the box. Not so visible, but surely as important is the CPC drawer. Since lots of choices for the configuration of the z14 ZR1 start with the CPC drawer, we should tackle that one first. 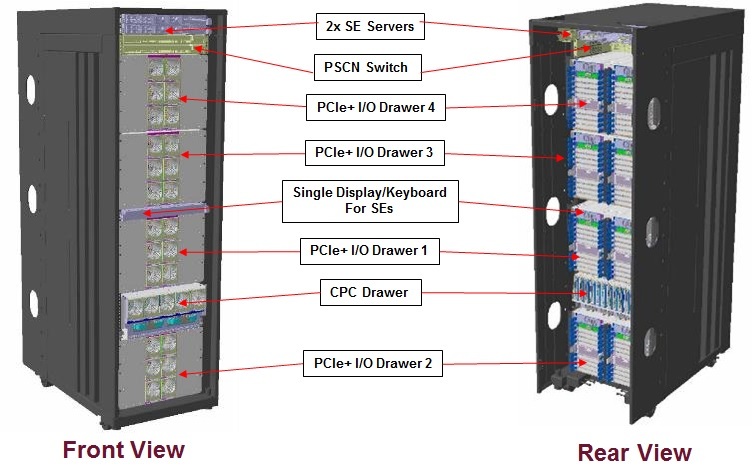 The CPC drawer has up to 4 PU Single Chip Modules (SCM's). I deliberately say 'up to' four because the system does NOT come with all four SCM's directly installed. Here's a first choice you have to make. How many CP's will you need and, on top of that, how many other configurable PU's will you need. When you choose FC0636 you only have 4CP's at your disposal, 1 PCIe+ I/O drawer, no extra configurable PU's and a maximum of 2TB of memory. At the other side of the spectrum with FC0639 you can have 6 CP's (which is still the maximum). You'll have 30 PU's at your disposal and can have up to four PCIe+ I/O drawers and up to 8TB of memory. So choose wisely when you order your z14 ZR1 since, once again, upgrades between the feature codes are disruptive. But when you take a closer look at the table above, you see that there's another feature code mentioned : FC0617. This has, as you can see, especially an impact on the number of I/O drawers. Since we are using a standard 19'' rack, customer equipment can also be hosted in the space allocated through the 16U Reserved feature. Such as SAN switches, Network Switches, Rack mountable HMC and TKE, Storage devices . . . Choosing for this 16U reserved space means that you cannot have a third or fourth PCIe+ I/O drawer in your z14 ZR1. Furthermore, it's a choice that, for the moment, cannot be undone. Once the FC0617 is on your system, even if you don't use the space, you will not be able to use this space afterwards for additional I/O drawers. So, once again, choose wisely ! Fit within 19” rail-to-rail width, and 28 1/4” (717 mm) front-to-rear depth. Must employ front to rear airflow. As I already mentioned, the system comes with only one model, but with four important feature codes which are also referred to as Max4, Max12, Max24 and Max30. This indicates the maximum of configurable PU's. So in the maximum configuration, we have 10 more PU's at our disposal as compared to the z13s. However the number of maximum traditional CPs remains at 6 also ranging from A01 to Z06 giving us 156 capacity settings. The smallest model, the A01 has once again a higher capacity than its predecessor. On the zBC12 it was 50 mips, on the z13s it was 80 mips and the z14 ZR1 has a slight increase with 88 mips. It has now 11 MSUs but it keeps having the same zELC pricing. So the software price for the A01 remains the same as for the zBC12 A01 with its 6 MSUs or the z13s with its 10 MSUs. This may have an impact on people who are still running on a small zBC12 with less than 11 MSUs. One single processor, and as you know all specialty engines are full processors, goes from 1430 mips to about 1570 mips. Upgrades are also slightly different. Up to now we always saw upgrades from N-1 and N-2 generations, but this is no longer the case. You can only have in place upgrades from a z13s. From a zBC12 there's is a migration offering. This means, no longer an upgrade in place, but we kind of simulate an upgrade and a new z14 ZR1 machine is delivered instead. No parts are taken over from the old zBC12. As you can see the PCIe+ I/O drawer can only have cards on the rear of the system. This will also have to be taken into account during the physical planning when e.g. upgrading from a z13s. You can have 16 cards per drawer and the number of drawers depends on your chosen feature code for the PU's. Here's an overview of which cards can be put into a PCIe+ I/O drawer. What was still a statement of direction for the two frame z14 model in July last year, has already become reality on the z14 ZR1 : it no longer supports InfiniBand features. This means that replacements have to be in place. For the Infiniband 1x there are the new Coupling Express Long Reach I/O cards (FC0433). These are I/O cards that fit into the I/O drawer instead of the Infiniband fanouts on the CPC drawer. Unlike the z14 you cannot have both on the machine to make transition somewhat easier. This will be a challenge when going to z14 ZR1. My story is pretty straightforward here. Similar to what happened with the z13s we don't see a new pricing mechanism but, again, a reduction to the AEWLC pricing. As compared to the z13s, you will have a reduction of approximately 5%. This reduction does not apply to IPLA (OTC) softwares. As I already mentioned the A01 has an extra MSU but remains on zELC pricing. This means the price remains the same as on previous A01 models. Furthermore, I've done some calculations to be sure and if you're still running on a zBC12 B01 (59 mips - 7 MSU) up to an E01 (88 mips - 11 MSU), you must really have a look at your software pricing. The difference surely is more than just that 5% ! Be also aware that when you are on or getting to z/OS 2.3, you have to define all your LPARs with a minimum of 8GB of processor storage. Since we have a different footprint ànd since we have to fit into the 'normal' datacenter standards, there are some attention points here. The dimensions and also the weight are different. AC only - No DC power. And as usual I can only say, for the physical planning, the Installation Manual for Physical Planning is your best friend. You should find all manuals in the library section on Resource Link. But I have the impression that a lot are still missing for the moment. But the Installation Manual is already there. In the Redbooks section, for the moment I only find the IBM z14 ZR1 Technical Introduction but more should follow. As usual, I could only scratch the surface and touch upon the highlights of this new system. There's much more to discover about it. And along with this announcement, there was one particular announcement that, of course, caught our attention : the End Of Support Dates for the z13 and z13s/ But I'll cover this in another post. So I can only say : Stay Tuned ! Yesterday IBM announced the new member of the z14 family, the z14 ZR1. Here's an introductory video. But stay tuned, there's another blog post coming up with all the details about this new system. I came across this on LinkedIn, the new place to be :-), and I just couldn't resist posting this over here as well. Do have a look at it. I don't know what this new year will bring us but I surely wish every one the best for 2018 : A Happy New Year and good health to you and your family. I know I haven't been blogging a lot this year and just picked out some highlights now and then. But still, thanks to all my readers for coming by at those moments, to all the people who referred to this blog via social media and to every one who gave me great support and feedback in 2017. Following a longstanding tradition, we will again organize a Benelux IBM Z Study Tour to the USA in 2018. We will go to our briefing centers in Poughkeepsie (IBM Z & LinuxONE) & Yorktown Heights (IBM Research) from March 12 – 16. Mark your agenda!!! How to incorporate Big Data with IBM Z ? Cloud: what flavor to choose and how to implement? And of course, the networking with colleagues, peers and IBM experts! The tour starts on Monday morning March 12. We are arranging group flights from Amsterdam and Brussels Airport. Return flight will be on Friday March 16, arriving on Saturday morning. Interested to join the Tour? Do let me know your interest so we can optimize the planning. If you are interested in taking this tour, you can of course also contact me for further information. Just a funny movie I came across via the LinkedIn page of Hans Deketele, z Systems & Power Platform Leader at IBM Benelux, and I just couldn't resist posting it. 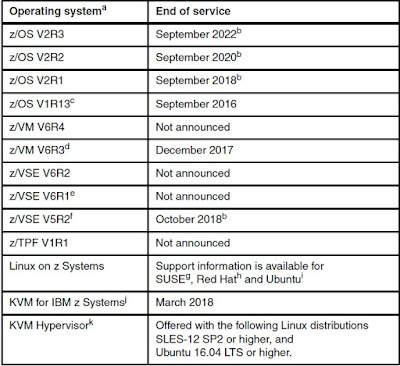 I was catching up on my reading and came across this nice overview of the End Of Service dates of all the Operating Systems. There are some footnotes which I haven't included. You can find them in the z14 Technical Introduction Redbook. You can always find an overview in our zSystems Newsletter as well. You can find the latest issue over here. Here's a nice little page comparing the z14 with its predecessors. It's pretty straightforward, but it immediately gives you and idea of what to expect compared to your current machine. So let's say you have a z13 N30 and you're considering upgrading to a z14 M01 or perhaps even an M02. Well, just select the systems you want to compare and you immediately have to most important items : model id, memory, new functionalities like e.g. Java Garbage collection, security and crypto cards, connectivity, networking, coupling links etc. Strangely enough OSA cards are missing. By the way, you can also select the Business Class but I must warn you : no z14s there . . . yet ! Yesterday on July 17, 2017, IBM announced the new z14 “IBM z14, designed to help you build leadership in trusted digital experiences” (ZG17-0017). Allthough the strategy that lead to the technical choices is really important, I’ll mainly concentrate on the technical aspects. But still, I want to share this slide, from a presentation on z14, that really sums up what it’s all about. Whatever platform you are using for your business, its core will always be your data and the applications you build around them.But some platforms might be more suitable to serve that purpose than others. And we all know that the mainframe has always been that kind of platform. With the new announcement of the z14 we see today, lots of attention goes to the data. How can we protect our data ? Think about data breaches or compliance regulations like GDPR. How can we use it to create business advantages ? Think about analytics and machine learning. And how do we expand the reach of our business by providing transparent access to application developers using APIs ? Think about how anyone can develop and deliver z/OS-based assets in minutes via RESTful APIs. It’s really not a coincidence that 80% of the world’s data and transactions reside on or pass through the mainframe. On to the technical aspects. No suprises concerning the name : IBM z14. The model is 3906. Don’t ask why. The looks have pretty much stayed the same with a nice touch of blue added. And there’s the addition of thin covers. But more about that in the physical planning. There’s the usual growth but once again there’s a really big increase on the memory side. We go from a maximum of 10TB to a maximum of 32TB. This means we go from 2.5TB per drawer to 8TB per drawer. Let's tackle some of the highlights now. Similar to the z13 the new system has four regular models and one large sized model, but the naming is a bit different, or should I say, easier. No fooling around with numbers of engines and hexadecimal ingenuities. Just M01, M02, M03, M04 and the larger model M05. For the regular models, every drawer has 41 PUs and with the M05 each drawer has 49 PUs. There are 2 designated spares per system. We have 5 SAPs per book. So if we take e.g. the M01 with 41 PUs, we subtract the 5 SAPs and the 2 spare processors, that leaves us with 34 PUs. Each system also has 1 IFP. And so we reach 33 usable processors for the first drawer. Consequent drawers have an additional 36 processors. As usual processors can be defined as Central Processors (CPs), ICFs, IFLs, zIIPs and optionally as additional SAPs. 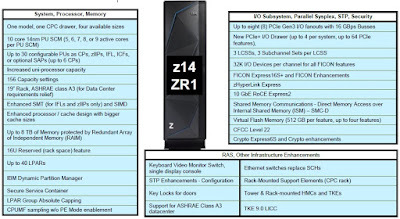 Here’s the overview of the PU allocation on the IBM z14. The z14 continues to support a 2 to 1 ratio for the zIIPs. zAAP are already out of the picture since the z13. A full processor (the 701 or a specialty engine) has a capacity of 1.832 mips as opposed to 1.695 on the z13. We have again three sub-capacity levels (4-, 5-, -6) now for up to 33 CPs. We start at a minimum of 256GB and go up to an amount of 8TB per drawer. An additional 192 GB of memory is reserved next to the customer purchased amount for the Hardware System Area (HSA). Next to that, more memory is in the box and is used for IBM Virtual Flash Memory (VFM) at which we will come back later on. Last time we went down from 5.5GHz to 5.0GHz. Now we’re going up again to 5.2GHz. The z13 also saw the introduction of drawers with Single Chip Modules instead of Multi Chip Modules in previous versions. The 8-core chip has now become a 10-core chip. For the techies I add an illustration of a fully populated z13 CPC drawer compared to a fully populated z14 CPC drawer. The main difference is that the two SC SCMs have been reduced to one per drawer on the z14. The on-core level 1 and level 2 caches have increased just as the on-chip level 3 cache. The level 4 cache has decreased a bit but this is countered by the fact that a single system controller means less latency. New instructions in the single instruction, multiple data (SIMD) facility offer a boost for traditional workloads using decimal operations (i.e. COBOL 6.2, PL/I 5.2) and new application like analytics (i.e. Apache Spark for z/OS). The z14 delivers next generation simultaneous multithreading (SMT). SMT on the z14 improves throughput up to 25 percent for an IFL or zIIP to benefit exploiters. SMT has been extended to support the dedicated I/O processors called System Assist Processors (SAPs). The new Guarded Storage Facility (GSF) will deliver ‘as good as’ pause-less garbage collection to enable enterprise scale Java applications to run with fewer and shorter pauses for garbage collection. The compression co-processor in each core has been improved to use fewer CPU cycles for compression and expansion and to support DB2 index compression. These features enable further improvements in DB2 memory usage, data transfer, and storage efficiency. And what are the upgrade scenarios ? You can upgrade from any air cooled zEC12 and z13 model to any z14 model. Upgrading from a water cooled model goes only to a z14 water cooled model. Another remark : Upgrading from a z14 model M01-M04 to a model M05 is not supported. The M05 is factory build only. This is an important one. In short, encryption should be pervasive, transparant and without performance nor application impact. Therefore the z14 brings pervasive encryption at all levels as indicated in the illustration below. It’s set up in order to defend and protect your critical assets with encryption but without compromising transactional throughput or response times. And it requires no application changes. By encrypting as much of your data and transactional pipeline as possible, you can reduce potential data breach risks and financial losses - and comply with complex regulatory mandates like GDPR. The IBM z14 gives you a transparent approach to encrypt virtually all of in-flight and at-rest data. Further, pervasive encryption can dramatically simplify data protection and reduce the costs of regulatory compliance. Using simple policy controls, z14 pervasive computing streamlines data protection for mission critical DB2 for z/OS, IMS and virtual storage access method (VSAM) datasets. The Central Processor Assist for Cryptographic Function (CPACF), standard on every core, supports pervasive encryption and provides hardware acceleration for encryption operations. It does this 2-6X faster than the z13 for data in-flight and at-rest. And the new Crypto Express6S card gets a performance boost on z14. It gives on average a 1.5X to 2X performance increase over Crypto Express5S. 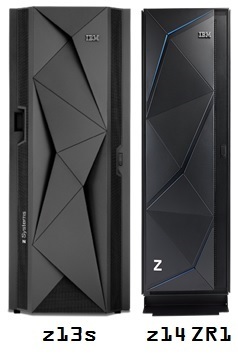 Combined, these two enhancements perform encryption more efficiently on the z14 than on earlier IBM Z servers. IBM Virtual Flash Memory (VFM) entirely replaces the Flash Express card and has the same use cases. But . . . is more performant. Estimations give up to 10% end to end performance improvement and (yes) 1000X improvement in Read/Write latency. You might remember the picture that was often shown to illustrate the performance gain you had with Flash Express. Well, we go one step further up the ladder. As far as capacity, you can go from 1.5TB up to 6TB, which means 1.5TB per drawer. And you can compare VFM to HSA. It’s memory but it doesn’t take away any memory from the purchased user memory. For those who already have Flash Express : during the upgrade there’s a feature conversion for it towards VFM. Additonal advantage : it saves you the two PCIe I/O drawer slots and there’s less power consumption. And to be complete : the same will be happening with zEDC. Its functionality will also move to the CP in the next generation. Apart from the name, I don’t think I should call this new. The first occurrence of this one was zAware introduced with the z12 back in 2012. You could call zAware a container like solution avant la lettre. But then again, what to say about Coupling Facilities. Later on with the z13, zAware was renamed to zACI or z Appliance Container Infrastructure. So now, Secure Service Containers is the new name for it. Containers have by now ‘conquered’ the world and it illustrates once again that the mainfame is quite a modern platform. For those not familiar with it, here’s a definition of Docker containers. "Docker containers wrap up a piece of software in a complete filesystem that contains everything it needs to run: code, runtime, system tools, system libraries – anything you can install on a server. This guarantees that it will always run the same, regardless of the environment it is running in." Software appliances are zAware, z/VSE Network Appliance and Operations Analytics for z Systems. You can find more information in Redbook SC28-6971 User's Guide. Not yet published at the moment this blog post was issued. Before I get to some of those, here’s a couple of graphs of what can be ordered on a new z14 and what can be carried forward. Everything that’s not mentioned like FICON Express8, Crypto Express4S and of course Flash Express cannot be ordered nor carried forward. FICON Express16S+ should, in combination with zHPF, give a real performance boost for FICON as well as FCP performance. zHyperlink Express is entirely new.and starts off where zHPF ends. For the moment it only works with DS8880. zHyperLink is a short distance mainframe attach link designed for up to 10x lower latency than High Performance FICON. zHyperLink will initially speed DB2 for z/OS transaction processing and later improve DB2 active Log throughput and VSAM applications. zHyperLink Express should give 7x faster read access and 10x faster writes of data. These are new Ethernet based Coupling Links using 10GbE RoCE technology. 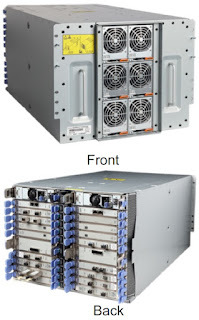 As a matter of fact, as you can read in the Statements of Direction, the IBM z14 will be the last z Systems high-end server to support HCA3-O LR fanout for 1x IFB (#0170). Customers should begin to think about a migration strategy for moving from 1X PSIFB to Coupling Express LR. Another difference with its predecessor : this is a card taking up a slot in the PCIE I/O drawer. It’s the same adapter as RoCE Express2 but with Coupling Optics and firmware. The distance is 10 km unrepeated and up to 100 km with a qualified DWDM. The cabling utilizes the same 9u Single Mode fiber type as 1X IFB. It becomes also available on the z13/z13s systems but it will require an IML before the first Coupling Express LR may be utilized. So a planned outage is necessary on those machines. For the physical planning, nothing much has changed. New Feature - Thin Covers : System depth for air cooled machines with thin covers is reduced by 14.7 inch or 37.33 cm and weight is reduced by 108 lbs or 49 kilo. The software pricing is again pretty straightforward this time. It remains the same for MLC : AWLC. Still, there’s a benefit of on average 5%. How is it realized ? Quite simple, there’s a reduction on some softwares depending on the MSUs of the machine, as also happened with the z13. IBM is introducing Container Pricing for IBM Z for qualified solutions running on IBM z13 and z14 servers. Container Pricing will provide simplified software pricing for qualified solutions. Additionally, Container Pricing will simplify pricing and billing on the IBM Z platform, by superseding a number of existing price offerings and by fully automating the billing process. One example : the Payments Solution will provide a "per payment" pricing option for IBM Financial Transaction Manager for z/OS deployments. This new offering directly ties operational cost to business value by basing the price on the number of payments processed, rather than capacity used to process them. Container Pricing for IBM Z is planned to be available by year end 2017 and enabled in z/OS V2.2 and z/OS V2.3. Sub-capacity pricing for the z/VM V6 operating environment is available to clients running z/VM Version 6 Release 3 or higher. Software pricing at less than full machine capacity can provide more flexibility and improved cost of computing as a client manages the volatility and growth of new workloads.Through the implementation of sub-capacity pricing for select z/VM programs, clients can pay for z/VM programs based on defined workload requirements and not necessarily the full engine capacity of the machine. There are separate announcements for those new prcings at which I may come back later on. 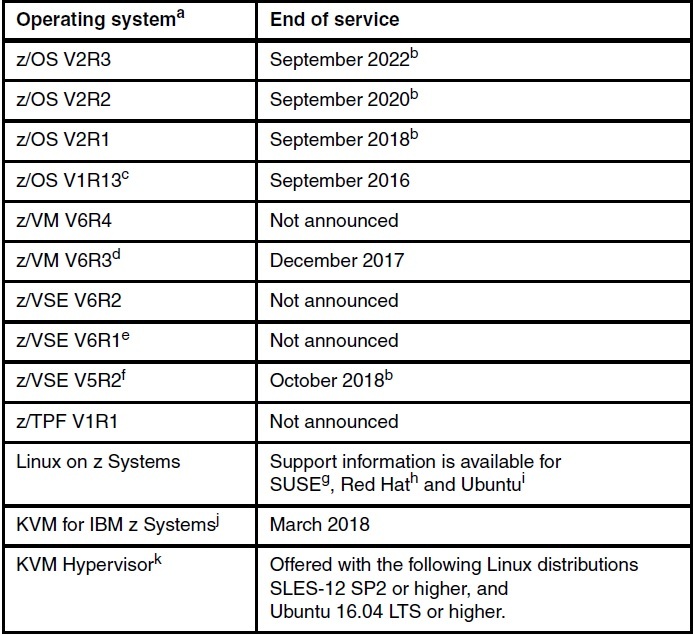 IBM z14 is planned to be the last z Systems server supported by z/VM V6.3 and the last z Systems server that will be supported when z/VM V6.3 is running as a guest (second level). z/VM V6.3 will continue to be supported until December 31, 2017, as announced in announcement letter # 915-025.
z/VM V6.4 will be the last z/VM release supported as a guest of z/VM V6.2 or older releases. z/VM V6.4 will be the last z/VM release to support tape as a media option for stand-alone, hard abend, and snap dumps. Subsequent releases will support dumps to ECKD DASD or FCP SCSI disks only. IBM z14 will be last z Systems high-end server to support FICON Express8S (#0409 and #0410) channels. Enterprises should begin migrating from FICON Express8S channels to FICON Express16S+ channels (#0427 and #0428). FICON Express8S will not be supported on future high-end z Systems servers as carry forward on an upgrade. 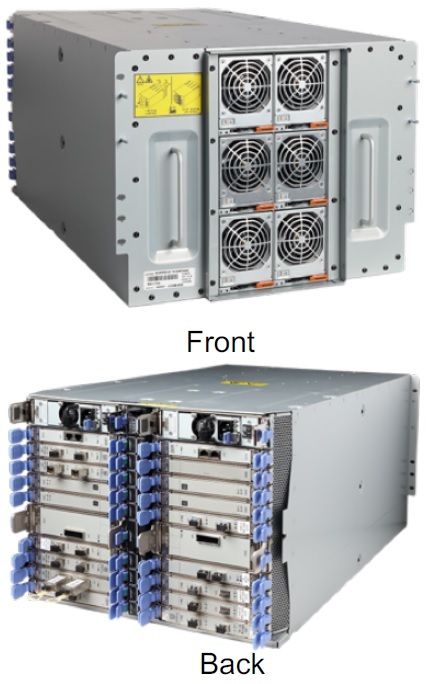 IBM z14 will be last z Systems high-end server to support HCA3-O LR fanout for 1x IFB (#0170) and HCA3-O fanout for 12x IFB (#0171). Enterprises should begin migrating from HCA3-O channels to ICA SR and/or Coupling Express Long Range. 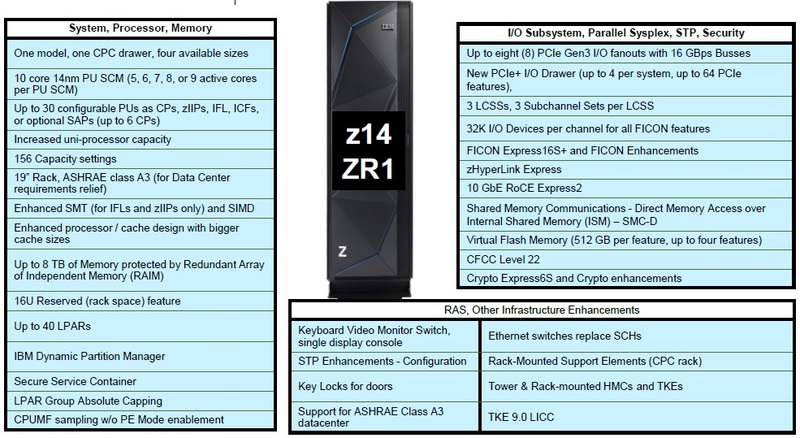 IBM z14 will be the last z Systems high-end server to support zEDC (#0420). In the future, z Systems high end server zEDC functionality will move from the zEDC adapter to the Central Processor (CP). OSA-Express6S 1000BASE-T adapters (#0426) will be the last generation of OSA 1000BASE-T adapters to support connections operating at 100 Mb/second link speed. Future OSA-Express 1000BASE-T adapter generations will support operation only at 1000 Mb/second (1Gb/s) link speed. There are some new and updated Redbooks available. They should all be grouped on a special page dedicated to z14 which is normally over here. Here's a short overview of a couple of them..
Of course you can also find all manuals in the Library section of Resource Link. Here's just a small selection of items and key dates. Well, that's about it for the moment, I'm planning some follow up posts and we'll also publish our Realdolmen z Systems eZine in the coming days. Ready for something Big ? In the digital economy, trust is everything ! Here we go again, IBM seems to be announcing something big, it's close to my vacation, so people who frequently read my blog know already enough. Here's the page announcing an event with a countdown counter. Here's the accompanying text : "Join us on July 17, 2017 as we reveal technological breakthroughs that will bring greater security, transparency and value to every interaction and transaction". One other piece of information we're getting : "300% performance advantage. Trusted companies outperform others by nearly 3x". I'd say, stay tuned for more information ! Yesterday, IBM issued a Red Alert on CICS V5.3. Here's the info. I'm just taking over the text from the Red Alert. Two or more CICS tasks obtain the same Unit Of Work ID (UOWID) and pass the ID to the respective subsystem. The subsystem may then experience unpredictable results because it thinks that it is being called out of sequence for just one unit of work. APAR PI82188 describes symptoms that have been observed, such as CICS DB2 applications abend or CICS CFDT records become locked due to two CICS tasks passing non-unique Unit Of Work IDs. However, this can affect any CICS subsystem, not just DB2 and CFDT. Please see APAR PI82188 for additional information. Apply PTF UI47871 for CICS TS for z/OS V5.3 APAR PI82188 as soon as possible to prevent unpredictable results. If you haven't signed up to the Red Alerts by now, you really should do it. Just go over here. IBM Belgium is organizing another z Systems Study Tour to New York from May 15 until May 19, 2017. Should you have any questions, you can contact me or else Hans Deketele, who will no doubt make this once again a flawless organization (hans_deketele@be.ibm.com). Here's an extract from the invitation. Following a long-standing tradition, we have again organized a Benelux z Systems Study Tour and hereby, I have the pleasure to send you your invitation to join us during this year's z Systems Study Tour to New York City, USA taking place from May 15 to 19, 2017. LinuxONE: Linux your way, Linux without risk and Linux without limits! ... and of course the intense networking with colleagues, peers and IBM experts"
This time the main focus is on Backup&Recovery with three customer testimonials. I'm not sure about the GSE z/OS Working Group meeting. It should take place at our own Realdolmen HQ in Huizingen on Wednesday December 14, 2016, but so far I haven't seen any invitation or agenda. "Join this webinar to hear the technical details of the latest updates to the DS8000 family. A new generation of High Performance Flash provides better performance and lower operating costs. Greater synergies between DS8000 and z Systems as well as enhancements to Encryption, Copy Services management, and the user interfaces will be covered as well as a performance update." This session will review recent changes, maintenance, and new features in the CSI TCP/IP for VSE product..
Just one quick addition that might be interesting for planning your agenda in 2017. For Europe the IBM z Systems Technical University seems to be planned in October instead of the usual time frame in May or June. Have a look over here. Just go to the end of the list and click on 'Show More'. Here's an annoucement with a list of softwares IBM has withdrawn or will withdraw from marketing in the near future : "Software withdrawal and statements of direction: IBM z Systems platform selected products - Some replacements available (ZP16-0639)". This is about withdrawal from marketing, not about ending the support. I just make a random pick of some of the softwares, but check the list, if you intend to order extra software in the future. Just to be sure you can still order it. IBM DB2 Query Management Facility™ for z/OS 11.2.1 will be WDFM on April 10, 2017 and will be replaced by IBM DB2 Query Management Facility for z/OS, V12.1.0. IBM Enterprise COBOL Developer Trial, Value Unit Edition and the Enterprise Edition for z/OS Version 5 are WDFM on September 11, 2017 and replaced by their Version 6 successors. IBM z/VM V6R3 was WDFM last month on November 7, 2016. It is being replaced by z/VM V6R4. For the entire list, please check out the announcement itself. I'm an employee at NV Realdolmen (Belgian IBM Premier Business Partner). I'm mainly involved in all pre-sales activities and systems architecture for IBM z Systems and IBM Storage. Opinions expressed here are my own.